Flights into and out of Townsville have been cleared to resume as the airport reopens amid the severe flooding that has hit the region. Townsville Airport said in a post on its Facebook page the airport would reopen at 1400 local time on Monday. “Passengers are advised to factor in extra time to their journey for processing through the terminal, with staff numbers impacted by the flood. Food options are limited with no cafes or bars open,” Townsville Airport said. 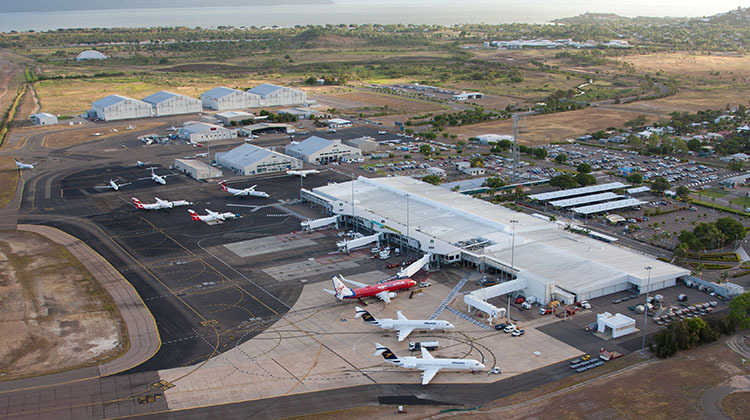 UPDATE: Townsville Airport will reopen its doors at 2pm today. Passengers are advised to remain in close contact with their airlines about updated flight times. Please factor in extra time for processing through the terminal, with staff numbers limited. No cafes or bars open. Authorities made the decision to close Townsville Airport for safety reasons on Sunday evening, as the North Queensland city faced floods that Premier Annastacia Palaszczuk described as a once-in-a-century event. Townsville Airport asked passengers to check with the airlines for updated flight times and thanked everyone for their understanding. “We appreciate your patience, with staff doing everything they can to get our passengers where they want to go,” the airport said. Virgin Australia has cancelled a total of nine flights into and out of Townsville to Brisbane and Sydney on Monday, according to a message posted on its website, with affected passengers contacted directly via SMS and email. However, it said the VA375 Brisbane – Townsville and VA378 Townsville – Brisbane would operate as scheduled. Qantas said on its website it would be rebooking passengers with alternate travel plans for those affected by cancelled flights. Jetstar said on its website passengers on cancelled flights could log into their booking online and choose a new flight at no extra cost or get a credit voucher. Tigerair Australia does not fly to Townsville. Townsville Airport said vehicles in the car park were not affected by flooding. The heavy rains led authorities to open the floodgates at the Ross River Dam, following an estimated 450mm of rain that has fallen over the catchment in the 24 hours to Monday morning. Hundreds of residents sought protection from the floods in evacuation centres. A look at the state of the floods from Brisbane’s Courier Mail Twitter page. VIDEO: The moment the floodgates of the Ross River Dam automatically tripped open in Townsville yesterday. Video: Neilly Group Engineering via Storyful. Great overhead photo of TSV….however maybe we need a new one as this depicts a VA 737 in the old colours many years ago. Need to send Seth up there for a photo !